This a super cute scene haircut for girls with short and thick hair. The thick hair makes the bangs stay in place and not look too sparse. Use some molding paste and push all the hair in one direction for an adorable scene style. Punch up the style factor with a bold color like turquoise! 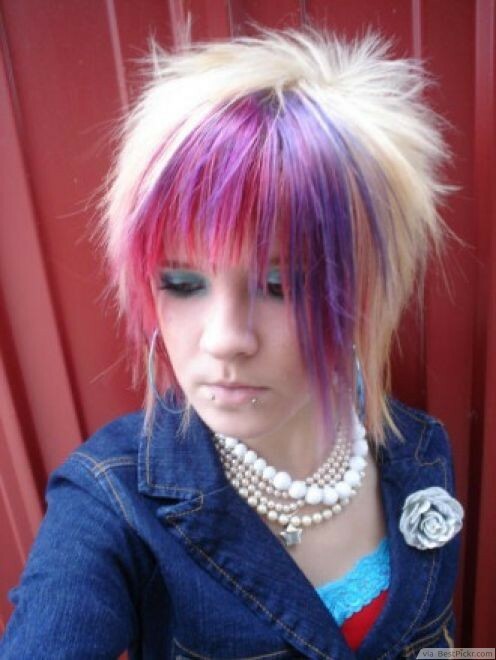 Be the sweetest scene girl of the bunch with this candy colored hairstyle. Pinkish purple and blue highlights create a fun and whimsical look. Tease the sides and back of your hair and then smooth over gently for polished volume and height. The bangs are pulled forward from the center of the head so there isn’t a part and they frame the face perfectly. Layers are cut into the lower half of the hair to taper it in at the bottom. Be a red hot scene girl with this Emo hairstyle. A short faux hawk cut can be eye catching in its own right, but take it to the next level with a vivid red hue and it’s a showstopper. Keep your layers a little longer on top to be able to style, and some hair wax and style away. Don’t be too precise in your texturizing, it’s the unpredictability and imperfection that makes this such an awesome scene look. 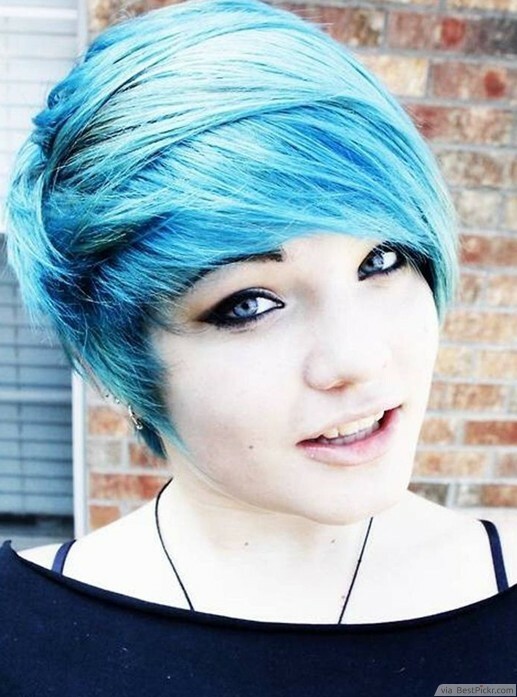 This is a gorgeous and one-of-a-kind haircut perfect for scene girls with wavy short hair. Although the haircut begins similarly, this is not your average stacked bob. The back is full of short layers as the hair graduates in length towards the face and layers throughout the top and sides allows natural texture to be free. The ultra-short uneven bangs create a really interesting and different scene style. If you want to make an impact, but don’t want to bother with a ton of styling, then this is the short scene hairstyle for girls you’ve been looking for. The hot pink is so pretty and guaranteed to catch you a few compliments and stares. Use a little hair wax for a tousled I-just-rolled-out-of-bed look and you can be out the door before you know it! This is a super cute haircut for girls with short, straight and thin hair. Cut extra short layers in the back to allow them to stick up and create volume. Grab some molding paste and play around with texture. 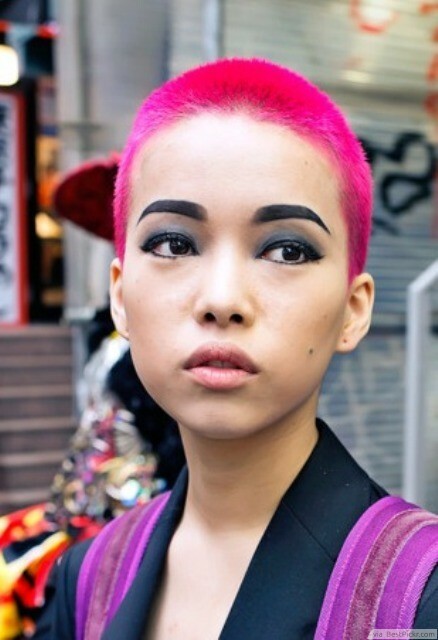 For an even bigger scene bang, dye an area this vivid pink and purple combo. It’s fairly simple. Section off a triangle shaped potion of hair in the front and it will lay perfectly in the bangs and a bit of the sides when you’re finished. 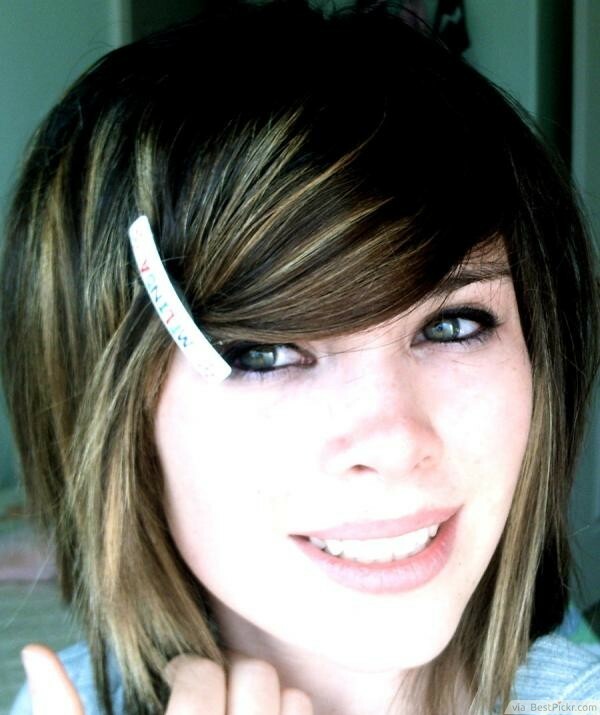 This is an adorable hairstyle for the “scene girl next door”. The soft layers in the short bob are ultra-flattering and the bangs can be made heavy by parting the straight hair far to the side. Add a cute accessory for an even more eye catching and personalized haircut! Think shaved haircuts are boring? Think again! You can still flaunt your scene style and show off your feminine side with a crew cut. Try a bold color like fuchsia to really set yourself from the crowd. Also, this hairstyle is virtually style free so steal an extra hour of sleep in the morning instead! 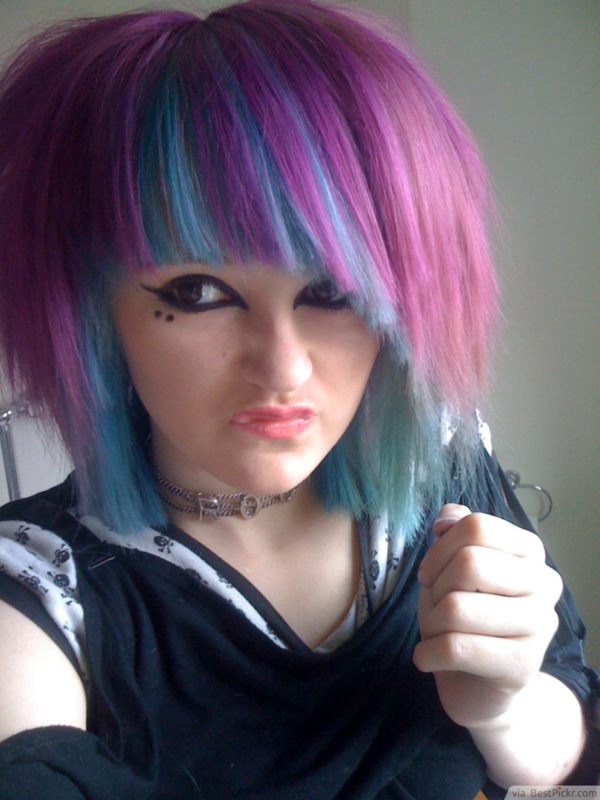 If you’re a scene girl who likes to keep her hair short, this is the perfect hairstyle for you. 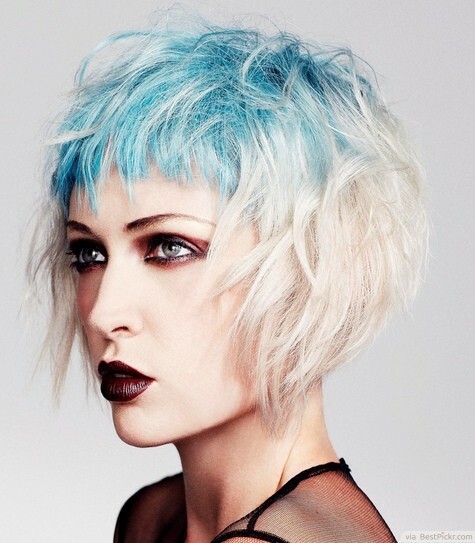 It’s heavily layered with choppy layers all the way around the head. The bangs dust the top of the eyebrows for a cute and stylish look. 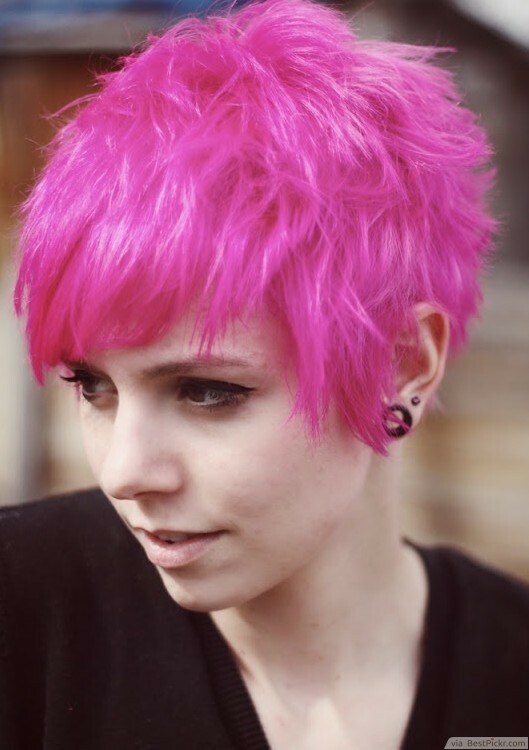 Is you want to add even more scene style, dye the under-layer of the bangs a vivid pink (or other color) for a peekaboo surprise.